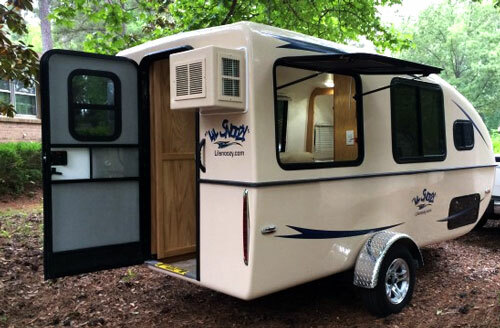 Lil-Snoozy camper built from fiberglass w/foam core, thanks to its stylish ultra-aerodynamic shape and well-thought layout offers all you will expect to see in modern travel trailers…. 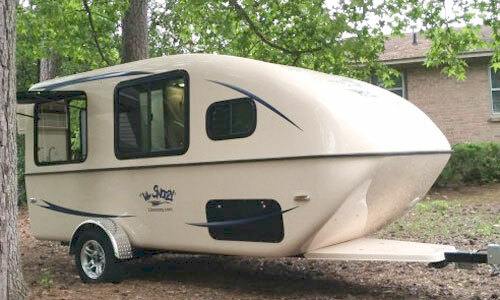 Lil-Snoozy fiberglass travel trailer is a youngest “child” of Alan Smoak – a man with years of experience in fiberglass business (boats, swimming pools….). Actually, more accurate will be to call it is his “grand-child” not only because he started RV business after well-deserved retirement, but also due to the love and passion he put behind into the design of the Little-Snoozy camper. His motto: “Good Enough is Not Good Enough” may be disputed by seasoned engineers usually preferring an approach that “Better is an enemy of Good Enough” , but after seeing the amazing end-product with its beautiful ultra-aerodynamic shape we can give good amount of credit to Mr. Smoak for his boldness. Indeed- the continuous effort to make something better makes sense provided that the final product is finished on time and available, and keeps intact the most important parameters: functionality, reliability and simplicity. After all, camping adventure means exploring the Mother Nature, and She does not like lavishness nor any excesses (read it – polluting unspoiled nature gadgets). Fortunately it seems that Mr. Smoak was able to keep good balance between both mentioned sayings. 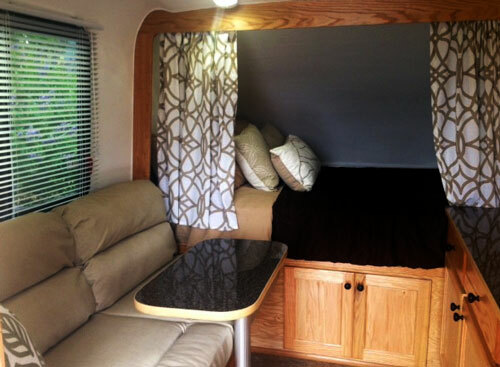 The Lil-Snoozy travel trailer is manufactured by Smoakin Concept Composites (South Carolina) since about 2012. The unique manufacturing process proves that not all fiberglass trailers are the same. Smoak, thanks to his experience in fiberglass industry came up with the shell made from five layers of fiberglass with high density foam laminated in between. This manufacturing process called “coring” (fiberglass w/foam core) is used throughout the entire structure including floor and results in improved thermal insulation. This technology differentiates Lil-Snoozy camper from other manufacturers of fiberglass campers. All Lil-Snoozy travel trailers are manufactured and built per custom order. The shell can be left “empty” so the camper can be used as a toy-hauler. It even can be sold without the frame (just a box) if that is customer’s wish. But thanks to Mr. Smoak ingenuity, the company came up with a well-thought standard layout plan offering seemingly impossible: generous living area, full-size queen bed, folding sofa, galley and wet bath - all that within the walls of let’s face it – small travel trailer. Actually the living space in camper’s standard configuration is so large, that one can carry there a motorcycle. The bed (63” x 79”) is located at the front of the camper in the round-shaped camper’s nose. The innerspring mattress (instead of typical foam mattresses) promises relaxing comfort. The jack-knife couch on the driver side of the trailer with small dinner table faces the “unassigned” wall that can be used as an entertainment center (if you really cannot live without it, the flat-TV screen up to 42” can be installed). But the true nature lover will certainly prefer in this place an additional panoramic window (one of available options). Talking about the windows – it should be noted that all of them are really exceptionally large bringing this beautiful feeling of being inside, but at the same time in the middle of the surrounding nature. The kitchen area includes sink, refrigerator, microwave (optional) and removable 2-burner electric cooktop. The kitchen cabinets, including overhead ones and plenty of drawers offer a lot of cupboard space. 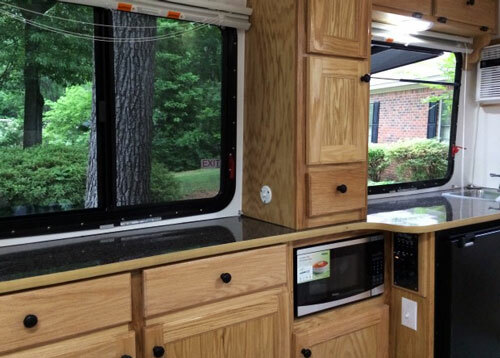 What may be surprising, they are fully made from red-oak (traditionally, in campers only doors are made from the real wood, while the rest is manufactured from pressed-wood boards or in the best case – from plywood). I guess, it is not only to improve aesthetics of the camper, but probably also to match the durability of “lasting forever” fiberglass shell. The 7 sq. ft. wet bath across the kitchen (at the back of the camper) includes the shower and porta-potti toilet. However, the customers may consider choosing an optional Thetfort Cassette toilet which comes with a removable (from exterior) waste tank. It’s a clever solution because it is much easier to remove the waste-tank (cassette) from the outside compared to porta-potti when the waste-box has to be removed from inside the bath. Anyhow – both toilets do not need a traditional Black Water Tank so the whole “emptying” process is much cleaner (the portable waste-box can be emptied in any public toilet and you do not need the ”stinking” drain hose. Another surprise: the Lil-Snoozy camper was designed and manufactured as LPG-free (factory does not offer optional propane installation). In other words all appliances are electric (compressor-based refrigerator, cooktop, as well as water heater). That is quite risky solution, because LPG gas offers much bigger energy autonomy than the electrical battery. As one of the solutions to solve the energy problem the company proposes an optional Power Generator that can be installed in front of the camper on the tongue (BTW – the generator can be run even when towing on the road). The main reason why the LPG was eliminated from the camper is obvious – it always brings the danger of propane leaks, especially treacherous in small closed areas. One more downside of all-electric camper is hot water availability. While the propane water heater gives instant results, in the case of electric one you may have to wait good few minutes (according to manufacturer about 7 minutes) to heat the water. And the question still has to be answered - what means "hot water".... (as this is a personal perception). Unfortunately, so far the company did not offer any “built-in” solar solution that hopefully will increase the energy autonomy. We can only hope that it is being seriously considered as an integrated solution! The spacious storage area is located under the queen-bed with the access from the inside (mirror doors) and from the outside. The interior, despite offering all needed amenities still feels quite spacious. Certainly good interior layout with entrance doors located at the back of the camper as well as wide wheel spacing (no space lost to wheel wells) and very large “reaching-out” windows greatly helps to feel it roomier than it really is. The AC unit was intentionally mounted on the back wall. Placed in the fiberglass cover, it does not change much aesthetic lines of the camper and does not increase the aerodynamic profile. The roof-mounted AC was intentionally eliminated from the design to keep the exterior height at minimum. Thanks to this decision, the Lil-Snoozy travel trailer can be easily stored in the typical, single-car garage. The rear bumper is made from steel and can accommodate and extra bike rack. The long list of options as well as almost unmatched flexibility in customization of the standard layout greatly helps to fit Lil-Snoozy camper to customer needs and budget….